Secretary Education Anil Swarup addressed the media on Friday evening and answer the questions about CBSE paper leak. 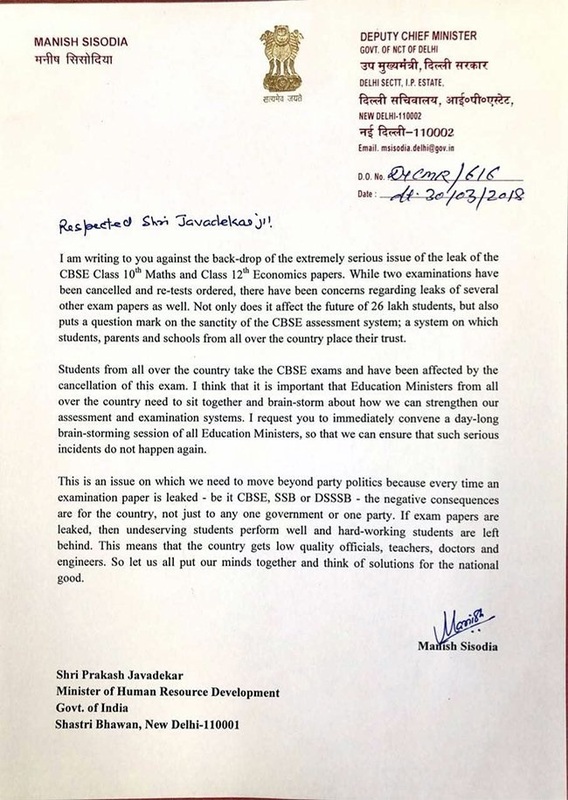 In his statement, Swarup said that class 10 paper leak was restricted to Delhi and Haryana only. The examination will be re-conducted in July and dates for the exam will be declared within next 15 days. While the class 12 Economics exam will be re-conducted at all India level on April 25. 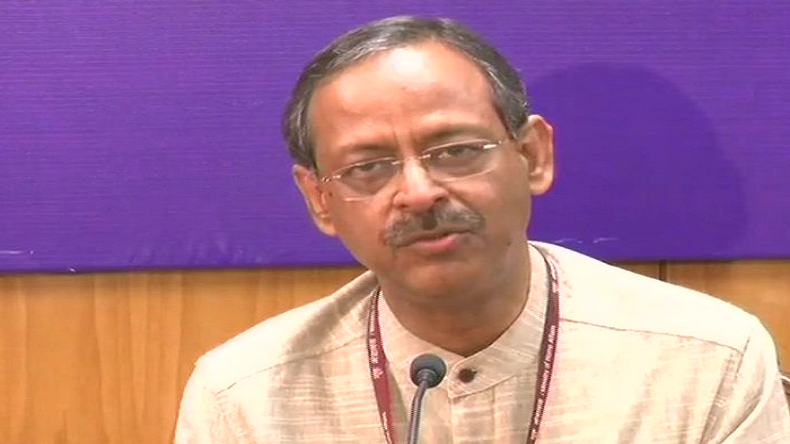 Secretary Education Anil Swarup addressed the media on Friday evening and answer the questions about CBSE paper leak. In his statement, Swarup said that class 10 paper leak was restricted to Delhi and Haryana only. The examination will be re-conducted in July and dates for the exam will be declared within next 15 days. While the class 12 Economics exam will be re-conducted at all India level on April 25. HRD ministery answered the questions of press and students. Swarup added that the probe is underway and strict actions will be taken against the culprits. In the row against the incident of question paper leak before the Central Board of Secondary Examination (CBSE) class 10th and 12th board exam, students gathered and protest in front of CBSE office on Friday in Delhi. The Police has also imposed section 144 outside HRD minister Prakash Javadekar’s house. Police barricading is also arranged to stop the protesters as students have turned out in a big number. The students who appeared in the board exams this year are protesting with their parents. The protest by students raising their voice against the mismanagement and careless attitude of the CBSE official that kept the future and career of the students at risk. Students with banners and posters in their hands protested and created a ruckus outside CBSE building, Preet Vihar, Udyog Bhawan (Janpath) and Jantar Mantar in Delhi. Protesters also coined slogans against the board, saying they have to suffer because of mistake done by CBSE. The board has already announced the cancellation and re-examinations for the board exams. 18:13 PM— The enquiries will be conducted and the culprits will be punished for the wrongdoings. Dear @PrakashJavdekar – pls dont subject students n parents to re-exams. Let results stand. Instead investigate n identify those few that benefitted from leaked papers n cancel their results only! 17:27 PM— Secretary Education Anil Swarup will address the media today and brief about the latest updates from the governments end on the sensitive issue of CBSE paper leak which put careers of thousands of students at risk. 17:20 PM— CBSE chief Anita Karwal meets HRD ministry officials. 15:50 PM— The paper leak took place ideally before it reached the centre, These papers were opened from the sealed envelope, written in hand and then circulated on WhatsApp, said source. 15: 41 PM— Sources have reportedly said that the coping of the question papers was done before it reached the centre and the bribe was paid to the lower level staff through digital money. 15: 40 PM— PayTm was used as the payment method for the bribes, said source. 15:24 PM— HRD Minister Prakash Javadekar shared his views about the CBSW paper leak at Smart India Hackathon2018 in Delhi. 14:33 PM — Parents write a letter to HRD minister Prakash Javadekar demanding no-retest in the Mumbai. 14:07 PM — Delhi Police crime branch identified 10 WhatsApp group in relation to CBSE paper leak matter, Investigation underway. 13: 56 PM— Congress President Rahul Gandhi mocked Prime Minister Narendra Modi saying PM will now write another book for stress relief for the students and parents after running their lives. 13:50 PM — MNS chief Raj Thackrey slammed the government by stating the paper leak incident as a failure for the government. he said that without accepting it, why do they want students to re-appear for the exam? I request to the parents throughout the country, don’t let your child sit for re-examination in any condition. 13:40 PM — Senior Congress leader Kapil Sibal questions government over the accountability for their wrongdoings. while addressing a presser, Sibal said said, #CBSEPaperLeak is not the only paper leak. The #SSCscam was another major concern. If the government does not take accountability for its wrongdoings, then who will? The board is likely to announce the new date sheet by next week. Board has also lodged an FIR in the matter and the probe is underway. In relation to the matter over 30 people have been grilled by the police today. Most of them either are running study centres or give tuition classes. In cognizance of the matter, Crime Branch has sought reply from Google about the email that was sent to CBSE chairperson. A mail was sent to the chairperson from a Gmail ID with images of handwritten questions papers.